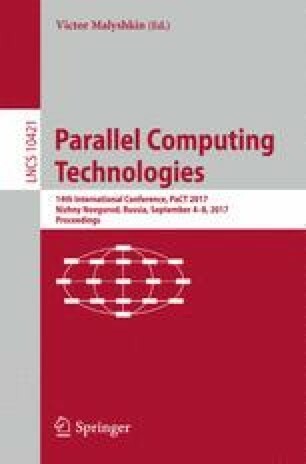 In this paper, a parallel implementation of the cellular-automata interference algorithm for two waves using the fragmented programming technology and LuNA system based on it is proposed. The technology is based on a strategy of data flow control. Unlike existing systems and technologies, LuNA provides a unified technology for implementing parallel programs on a heterogeneous multicomputer. The LuNA program contains a description of data fragments, computational fragments, and information dependencies between them. In the work, the LuNA program was executed on a computational cluster with homogeneous nodes. The results of comparison of the LuNA and MPI implementations showed that the execution time of the LuNA program exceeded that of the MPI program. This is due to the peculiarities of algorithms used for the distribution, search and transfer of data and computation fragments between the nodes of a cluster. The complexity of writing the LuNA program is much lower than for the MPI program. The work is supported by the projects of Presidium RAS 14.1, 15.4.